Halloween can be Terrifying to Dogs. | Leader of the Pack Home Dog Training | Proudly Serving the Inland Empire.Riverside, Orange and San Bernardino Counties. Halloween can be Terrifying to Dogs. Halloween can be a scary and dangerous time for dogs. 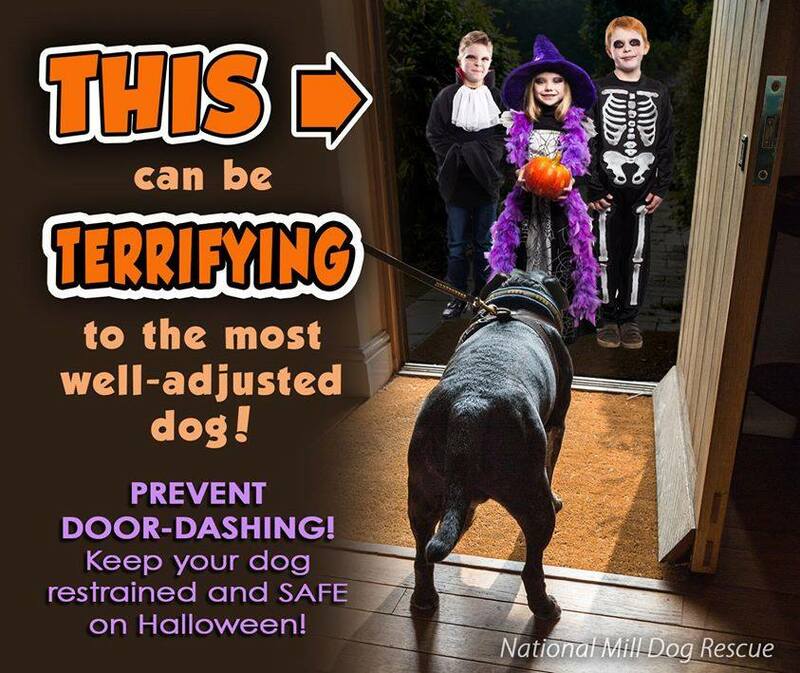 Please keep Halloween fun and safe for you and your dog. GHOSTS AND GOBLINS AREN’T SCARY. You dog does not see ghosts and goblins every day. He has no idea what they are and could react in a protective mode. Wear your costumes for a few days around him so he gets accustomed to those “weird creatures”. KEEP YOUR DOG INSIDE. Even if you have a fenced yard, the strange shadows and sounds can scare and aggravate your dog. Have him inside, away from the door with a family member to reassure him. KEEP YOUR DOG UNDER YOUR CONTROL. Make sure he is with a family member or in his crate during the festivities. It is important to provide the consistency of an environment he is used to and feels safe in. GIVE YOUR DOG ATTENTION. If your dog seems unsure or pensive because of the Halloween activities, provide him with extra attention. Put him on a leash and walk around the house, play with him in a back room or sit and watch some TV with him. CHECK YOUR DOG’S ID TAGS. Even though you might have your dog in the house and think everything is fine, you will be opening and closing the front door many times during the evening. Make sure that your dog has his ID tags on his collar and his collar is firmly around his neck. If he is not in your direct line of sight, check on him often. Even though you think he is with the kids, you never know. WATCH OUT FOR PUMPKINS AND CANDLES. Chances are that your dog will get excited or agi-tated sometime during the evening. This could cause him to knock over a Halloween candle or lit pumpkin. Think of using battery-powered candles this year. DRESSING YOUR DOG IN COSTUME. Just because you like to get dressed up, it doesn’t mean your dog wants to get into that pirate costume. If your dog gets agitated when you are put-ting on the costume, don’t do it. If you really want to dress him up, put a bandana around his neck or bow in her fur. CANDY AND DOGS DON’T MIX. We love chocolate and nuts and sweets and all other types of candies. The problem with Halloween is that there is just so much of all those things. We leave them out or drop them on the ground for our dogs to easily find and eat. Chocolate and many artificial sweeteners found in candy are poisonous to dogs. Swallowing the wrappers can also cause gastronomic issues. Be sure to keep all candies high and away from your dog. If your dog starts to throw up or seem overly listless, call your veterinarian as soon as possible. CONSIDER YOUR DOG IN YOUR ACTIVITIES. 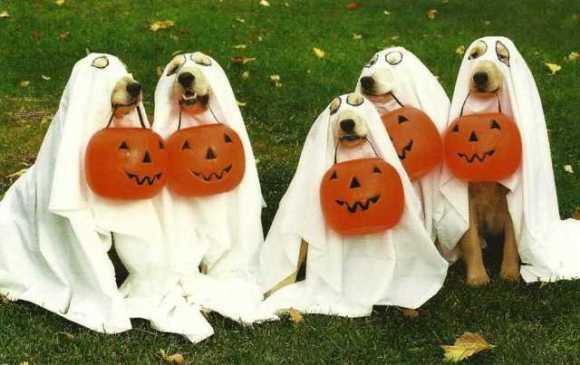 Many people think it is really fun to take their dogs with them while trick-or-treating. Watch out because this could be instilling ongoing fear and aggression with them. They don’t understand that the ghost leaping at them from the dark doesn’t want to hurt them or you. Strange, little hobgoblins poking them can make them uneasy. Keep your dog on a short leash and always ask people to stay calm and keep their distance, unless invited. PLEASE … make a plan for your precious pets and avoid a potential calamity! – Make it impossible for your dog to wiggle out; leash them (and hold the leash securely) or, better yet, put them in another room. – Make sure your dog is wearing a collar with your current phone number and any other important contact info. – If your dog is microchipped, verify that your information on file with the company is current and accurate. – If you must put your dog in the backyard during the festivities, please make sure your fence is secure and your gate securely latched and locked. – Remember, too, that CHOCOLATE and XYLITOL (a sweetener found in many candies) are TOXIC to dogs and cats, as are macadamia nuts, raisins and grapes. Make sure you do not leave candy anywhere they can get to it … including a purse!